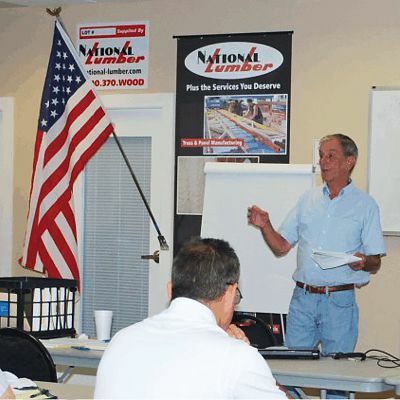 As a service to our contractor customers, National Lumber hosts and sponsors important educational classes that are not only informative, but also help serve requirements for new licensing requirements. Outside training companies use the National Lumber Training Room on the second floor at our store location at 245 Oakland St in Mansfield, MA. Classes are open to both customers and non-customers, but all require that you register with the specific training company for their class. Scroll down to see information about each of the companies. Construction Supervisor Licensing (CSL) CEU's is the most popular training, and we have found several companies from which you can choose. Other training classes such as for EPA RRP lead-safe certification, are available periodially. Join our email list to receive the monthly training classes email. DISCLAIMER: National Lumber is hosting these events for your convenience, and not responsible for the events being offered. Registration and the content are handled by an outside company. By clicking on the links you will leave the National Lumber website and be taken to another company's website. NOTE: National Lumber and the training companies are not responsible for typographical errors in the information provided here. The ultimate authority for the information is the training company’s website. Mark Paskell (#CSL-CD-0075) is a training instructor for many of the courses and is an OSHA certified outreach trainer, EPA/RRP and Mass RRP approved instructor. Shawn McCadden (#CSL-CD-0078) is another training instructor with the Contractor Coaching Partnership. Shawn is a well-known Remodeling Industry Expert, Educator, Trainer, Speaker and Contractor Business Coach. You may have heard him speak at JLC Live events. You can email Mark at The Contractor Coaching Partnership or call 978-422-6354 to learn more about upcoming training classes. We keep it simple... The information that is taught and presented is the exact material that every Building Inspector, Building Department, Architect and Hoisting Engineer is trained on by the Dept. of Public Safety and the Massachusetts Board of Building Regulations and Standards (BBRS). We have top notch instructors... Our instructors are licensed, certified and currently practice in construction, building code and legal matters. Real construction experience gained from the field... sets our trainers apart from the rest. Our trainers' experience and knowledge is a result of working in the industry for a variety of clients across New England. They bring this experience to every course we teach. You will no doubt receive excellent educational material and the most current information available on construction, building codes and heavy equipment. You can email Cathy at Construction Supervisor Institute or call 978-566-1366 to learn more about upcoming training classes. Experienced trainer Phil Sheehan (#CSL-CD-0080) of Construction Safety Institute of New England has been holding classes at the National Lumber training room in Mansfield since 2013. Whereas most people can find CSL renewal material boring, Phil uses his humor and experience to bring the material to life. Phil teaches CSL renewal courses at our Mansfield Training Room. To reduce the training cost to you, refreshments and meals are not provided. You are welcome to bring your own and use the kitchenette facilities next to the training room. You can email Phil at CSI of NE or call 508-208-2631 to learn more about upcoming training classes and to register. We focus on the residential contractor. Why? Because that's who we are. Our vast experience comes from being contractors in the residential remodeling and new construction field. Classes are taught by experienced tradesmen. Courses include MA Contractor Supervisor Licensing (CSL), EPA RRP, Lead Safe Renovator (LSR), and OSHA Construction. Classes include lunch. You can email Sue at LeadSMART or call 888-731-5353 to learn more about upcoming training classes. Massachusetts Lead Safe Renovator (LSR) regulation and the EPA Renovation, Repair and Painting (RRP) Rule require contractors working on pre-1978 housing to be trained and certified. The course will teach you what you need to know and provide practical hands-on skills training. All training and course material is provided. Prior Environmental Training Services is an Accredited EPA RRP Training Provider and a Massachusetts Licensed Training Provider offering 8-hour Massachusetts Lead Safe Renovator (LSR) Training. Good for 8 MA CSL Continuing Ed credits. You can email Paula at Prior Environmental or call 508-963-2323 to learn more about upcoming training classes.